We cannot guarantee that a diamond or gemstone will not chip, break, scratch, or fracture. Therefore we strongly suggest insuring your jewelry. If you do not have an existing policy, we will be happy to provide you with a referral. We cannot be responsible for the further fracture or damage to stones or diamonds received from the customer that are already damaged, chipped, broken, or have large inclusions or imperfections. We will attempt to inform the customer of any potential problems we see before proceeding with any repair; however it is the customers ultimate responsibility to be aware of any potential problems. Special order items are considered a "final sale" and are not returnable. In some situations, we will make an exception and allow for the item to be exchanged within 14 days of delivery, as long as the item is in new condition. The exception must be written on the customers receipt. All special orders require a non-refundable deposit of 50%. Custom pieces made in our store are firmly non-refundable. These one-of-a-kind pieces are made to your specifications and in most cases cannot be resold easily. Because of this, we normally require a non-refundable deposit of 50% on any item that we make specifically for a customer. All refunds will be issued in the same format as the payment used to make the purchase. 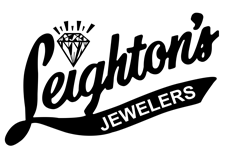 Leighton's Jewelers offers a flexible layaway plan. This program allows you to select an item and have us hold it for you while payments are made on it. We require a minimum deposit of 20% and a payment once a month. If payments are not made in a timely manner and no other satisfactory arrangements have been otherwise agreed to in writing, the item(s) will be returned to stock and/or orders will be cancelled. If a stock item is returned to stock, then the original deposit and all subsequent payments received will be applied to store credit, which may be used toward the purchase of other merchandise and/or services. All custom, special orders, sale items and items designated as "final" or "as is" types of sales are subject to forfeiture of original deposits and all payments received.